The two main trout rivers of Mabandla Community Area are the Ngwangwane and the Gungununu, but there are also a number of tributaries of these in Mabandla that have held populations of Rainbow Trout and other game fish for almost a century. According to Crass (1986) both have the reputation of providing quality angling, for trout in the upper reaches of many steams, and KwaZulu–Natal Yellowfish (Labeobarbus natalensis) in the lower reaches of the Ngwangwane. Rainbow Trout (Oncorhynchus mykiss) are an alien (non-native) species which originate from North America, but which have become acclimatised to South African conditions. The first introductions of this species into Mabandla waters took place when it was government policy to encourage the stocking of trout into all favourable waters of the country because of the value for food production, for healthy outdoor recreational purposes, and to develop tourism. These first introductions, undertaken nearly a century ago, proved to be successful from those perspectives, but since the realisation of the importance of conserving indigenous biodiversity, such actions would not presently be condoned without some form of risk and benefit assessment being conducted. However experience has shown that once introduced, it is virtually impossible to reverse the situation in waters such as those present in Mabandla that seem to be favourable to them. Despite severe droughts such as those experienced in the 1980s, and in the past year, in which populations declined significantly, the trout persisted and have become part of the aquatic fauna. That is, sufficient trout have survived to ensure continuation of their presence in a self sustaining population. This fact is significant from a fisheries management point of view. Several authors including Crass (ibid.) 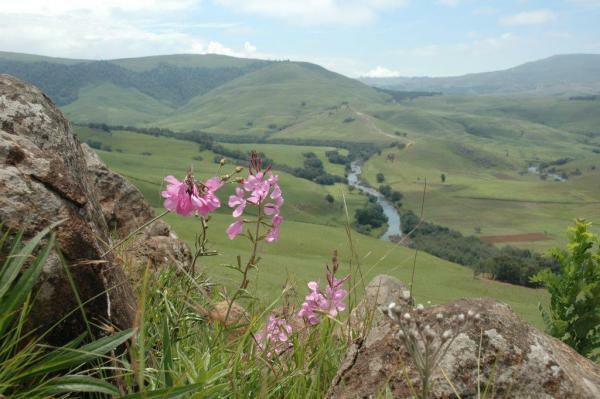 have rated both the Ngwangwane and the Gungununu as premier KZN trout waters. Few, if any, members of the Mabandla Community seem to be aware that trout are not indigenous to their waters, any more that they recognise that maize, sweet potatoes, ordinary potatoes and all common vegetables are aliens, and are not African. Trout have in fact become part of the folk lore of the community, and have been given vernacular names, just as have the indigenous fish species. Interestingly, trout are one of the wildlife species according to Hlatswako (2000) which, like bushbuck, bear separate names for the two sexes, because of their sexual dimorphism. Some community members (especially the youth), enjoy angling and eating their catches. Hlatswako (ibid.) records that trout are regarded as more palatable than the native yellowfish. Trout angling is also seen as a potential adventure tourism attraction, as an addition to the trout value chain. This is a useful complementary activity to other ecotourism options available in the area. As a source of business and employment opportunities as an adventure ecotourism attraction. Fly angling has been one of the fastest-growing forms of outdoor recreation. Good quality trout waters are scarce in South Africa, and are therefore potentially valuable. However, the trout waters of Mabandla are relatively remote and are largely unknown to the established angling community. Security in such a remote destination is an added unknown. Consequently, it may therefore be difficult initially to attract many anglers. Particular emphasis should therefore be given in the planning of facilities to provide the necessary safeguards for visitors who opt to come to Mabandla to experience the available angling as well as the other ecotourism options available in the area, in such a scenically attractive environment, managed by friendly people. The fact that trout breed naturally and do not have to be restocked annually, as in other trout waters such as in the Eastern Cape and Mpumalanga is of particular significance from a fishery management perspective. Such restocking operations are expensive and require considerable manpower and transport costs. This adds significantly to the values of the resource. Acknowledgement. 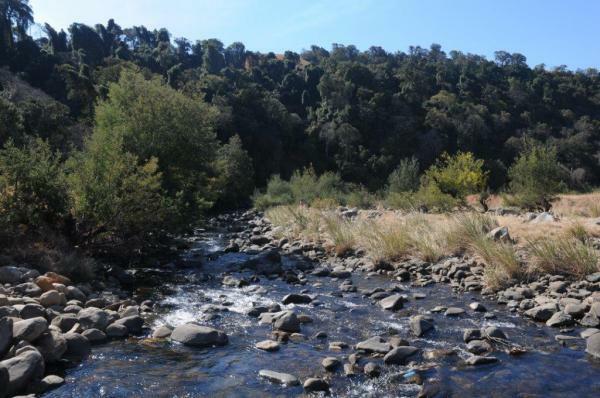 Knowledge of the trout resource at Mabandla was provided by two dedicated studies that were sponsored by the Federation of Southern African Flyfishers (FOSAF), the national fly fishing organisation. These are listed below. Alletson D.J. 2010. Findings of the Fish and SASS Surveys on the rivers in the Mabandla Community Project Area, and Guidelines for the Enhancement of the Fishery of the Area. Unpublished Report commissioned by FOSAF for the Mabandla Community. Crass, Bob, 1986. Trout in South Africa. Macmillan, Johannesburg. Hlatswako, S. 2000. Fly Fishing & Tourism ; a sustainable Rural Development Strategy? M Sc thesis, Centre for Environmental Development/School of Social Studies, University of Natal. Commissioned by FOSAF for the Mabandla Community. Skelton, P. 1993. A complete guide to the Freshwater Fishes of Southern Africa. Southern Book Publishers, Halfway House. NOTE: You may also visit one of the Umgano project websites - click here. Fly fishers wishing to visit this area should note that the rivers have been closed for a year to allow for trout populations to recover after the devastating drought of 2015/16. However, there are plans to erect a hut and provide other facilities for visitors wishing to fish and make use of the other eco-tourism opportunities in the Mabandla Community area. We will advise you of further progress on this website. Acclimatised means “have become accustomed to the new conditions that pertain in Mabandla, as opposed to that pertaining in their country of origin”.